Eye makeup – Beauty can’t be imagined without beautiful and pretty eyes. We use several types of products to increase the beauty of the eyes and try to make our eyes more stylish according to the season and fashion. But people forget that while using the various products to beautify the eyes, we loose the natural brightness of our eyes. We can protect our eyes by taking few precautions. First of all, when season changes frequently in few months, it is required to the keep changing the makeup style. Similar changes should be done in artificial eye lashes and coloured eye lens. But it is necessary to know about the important facts related to these eye cosmetics before using all these fashionable products, so that eyes should not face any problem by the use of these cosmetics. In the next paragraph we will talk about the eye cosmetics like maskra, kajal, eye-shadow and eye liner, which are generally used to make the eyes more beautiful and look attractive. While most of them may be fine for our skin, there are still some ingredients that can cause possible damage to the eyes. The commonly used eye cosmetics include – mascara, eyeliner (liquid and pencil), eye shadow and kajal or kohl. If any eye cosmetic causes irritation, wash the eyes with water and use clean cloth, never rub the eyes with hands. If irritation persists, see a doctor. Wash your eyes with clean water twice or thrice a day. Before coming out in bright sunlight use sunglasses to protect the eyes from harmful sunrays. It is necessary to keep precautions before purchasing sunglasss, never take ordinary sunglasses , because the glass used in it is of low quality and can cause harm to eyes. So always try to purchase the sunglasses of good company. Nowadays the use of small frame sunglasses is in fashion. 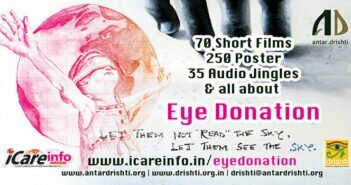 But small frame can’t help to avoid the entry of dust in in your eyes. It is good to use the sunglasses of photoframic lens which gives great relief while moving in bright sunlight. If in summer days you find your eyes red, wash your eyes properly with cold clean water and sit in cool place for some time. We have to take more safety measures while applying kajal on our eyes, the kajal stick or pencil should not be pointed. Kajal contains carbon particles which are harmful for eyes, which may cause conjunctivitis, eye flue and even there is possibility of corneal ulcer. In lack of proper treatment corneal ulcer results in severe swelling in eyes and even blindness. Women generally apply mascara on eyes to give dense look to eye lashes. Mascara is applied on the root of eye lashes with the help of brush. The chemical ingredients present in mascara gives rise to various types of allergy problems. So it is very important to be sure that mascara should not go inside the eyes while using, and if by incident mascara enters the eyes, eye should be immediately washed with clean water. And if you find any type of irritation (itching) or other problems while applying mascara, immediately stop using it. For precaution the mascara should be frequently changed after the interval of 2-4 months. Because using the one mascara for a long period can cause harm to our eyes and there is fear of eye infection. Eye shadow is applied between the eye lashes and inner skin to give attractive look to eyes. This also contains many harmful chemical ingredients. Continuous use of eye shadow can cause itching, allergy and other problems. If you feel any of this problem in your eyes, immediately stop using it. Use of artificial eye lashes has become fashion for the girls nowadays, because artificial eye lashes gives a attractive look to our eyes. 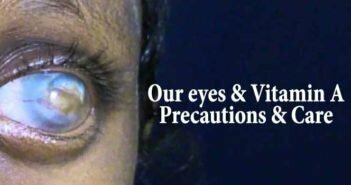 But we have to be alert and careful while applying and taking out this artificial eye lashes from our eyes, because it injure cornea of our eyes. There is possibility of conjunctivitis by using the eye liner in wrong way. And if by chance this conjunctivitis increases it can grow as sore in cornea. So it is better to use eye liner in liquid form and avoid use of eye liner in pencil form. By following the above steps you can keep your eyes healthy in summer and rainy season and your eyes will look beautiful and attractive.